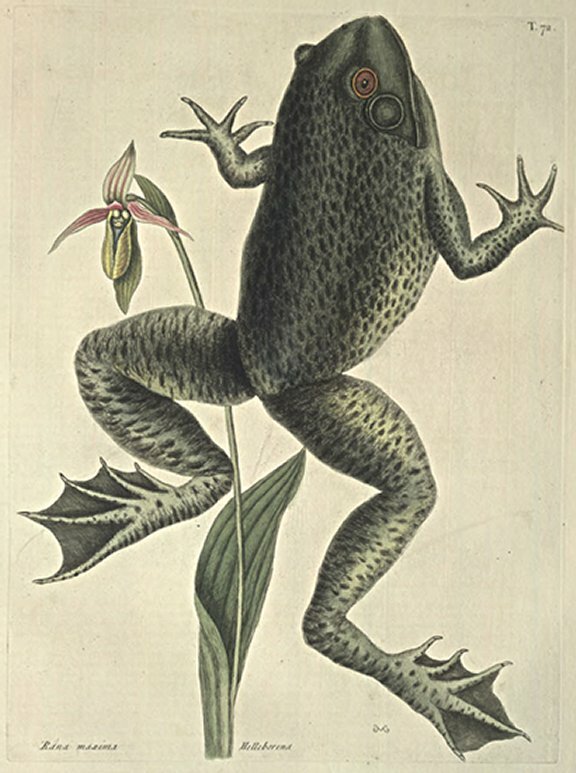 The Figure here exhibited is smaller than many of these Frogs I have seen: The Eyes were oval, very large and prominent, the Pupils having yellow Circles round them: The Irides of a dusky red, encompassed with a yellow Circle behind, and a little below the Eyes appear the Ears, of a circular Form, and covered with a thin transparent Membrane, which is the Membrana Tympani itself, which in this Species of Animals lies quite bare, and exposed, being even with the Surface of the rest of the Skin, having no Meatus Auditorius, or Passage leading to it, nor any Thing like an outward Ear to guard it. The Colour of the upper Part of this Frog, was dusky brown, thick set with large irregular limped Spot, of a dark brown Colour, the whole being blended with a yellowish Green, particularly the fore-part of the Head and Chaps; the Belly dusky white, with a Mixture of Yellow, and faintly spotted. These Frogs are less numerous than any other of the Frog kind, and frequent Spring, only, which in Virginia abound in the Sides of every little Hill, where by the continual running of the Water, a small Pond or Hole is usually made before the Mouth of the Spring, which is rarely without being possessed by a Pair of these Frogs: They are usually sitting on the Verge of the Hole, and when surprized, with a long Leap or two enter the Mouth of the Spring, where they are secure. It is the general Belief of the People in Virginia, that they keep the Springs clean, and purify the Water, wherefore they never kill, or molest then, but superstitiously believe it bode them ill so to do. The Noise they make has caused their Name; for at a few Yards Distance their Bellowing sounds very much like that of a Bull a quarter of a Mile off, and what adds to the Force of the Sound, is their sitting within the hollow Mouth of the Spring. Tho' the imaginary Usefulness of these Frogs is frequently a Means of their Preservation, yet their voracious Appetites often causes their Destruction, they being great Devourers of young Ducks and Goslins, which they swallow whole; this provokes the good Wives to destroy them, but as they are not very numerous, this Mischief is the easier prevented. This Plant from a fiberous Root rises with two or three single Stems, to the Height of ten or twelve Inches, with long ribbed Leaves, growing alternately, the Flower as it is longer resembles more a Slipper than any other of this Tribe that I have seen: It differs also from others of this Kind, in having a Slit from the Top to the Bottom of the Slipper; over the Hollow of which is fixed two small oval Bodies or Knobs, over which hangs a thin Membrane or Lappet, of a pale Red or Rose Colour, and under these Knobs is another Membrane of the like Form, but of a green Colour: The Four exterior Petals that compleat the Flower are placed cross-ways, and are of a yellowish Green, ribbed and stained with Red. The Slipper is of a greenish Yellow, with a Tincture of Red. This curious Helleborine was sent from Pensilvania by Mr. John Bertram, who by his Industry and Inclination to the Searches into Nature, has discovered and sent over a great many new Productions both Animal and Vegetable. This Plant flowered in Mr. Collinson's Garden in April, 1738.